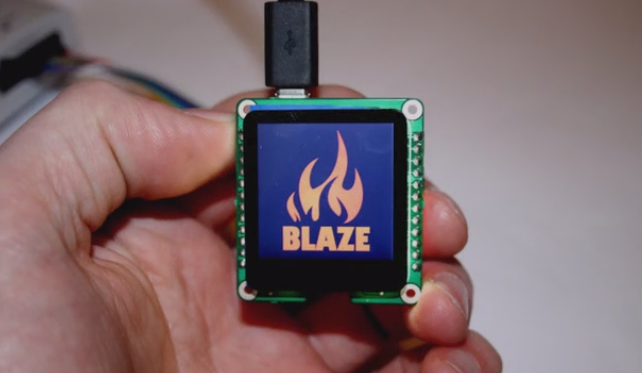 The project is asking for funding on Kickstarter: https://www.kickstarter.com/projects/thewebster/blaze-miniature-powerful-hackable-display-with-tou. The board has an impressive capacitive touch display with 240×240 pixels on the front an a Freescale/NXP Kinetis Cortex M4 (120 MHz, 512 kB FLASH, 128 kB RAM) plus an SD card on the back. 💡 That it is a Freescale part is visible in one of the videos. Unlike other projects and boards, it has the JTAG signals with other I/O pins on the sides, so I should be able to debug and develop for that board with Eclipse, GNU gcc+gdb with a SWD/JTAG debugger. 💡 The project includes an Arduino support. Maybe because these days not having the marketing ‘Arduino’ word will not get enough attraction? Nothing against using Arduino, this all depends on the developers skills and requirements. But it is definitely not my thing: I rather want to have something I can use and understand down to the bare metal with the usual Eclipse/GNU/SWD/JTAG tools. My 1 cent :-). The boards are expected to be available in March/April 2016 according to the information on Kickstarter. Until then I will consider some cool projects for which I could use that board 🙂 . This entry was posted in ARM, Boards, CPU's, Embedded, Freescale, Kinetis, NXP, Thoughts and tagged arm gcc, Eclipse, Freescale, gnu gcc, Kickstarter, NXP, technology, Thoughts by Erich Styger. Bookmark the permalink.